Apologies for the smudge, did not notice till I saw the image on my computer screen and the sun went away so I can’t take as nice of a picture again now that it’s clean. Well, looks like I’ve been bitten by the watch bug. I bought this Seiko SNK(Seiko 5) about two months ago and have worn it every day since. 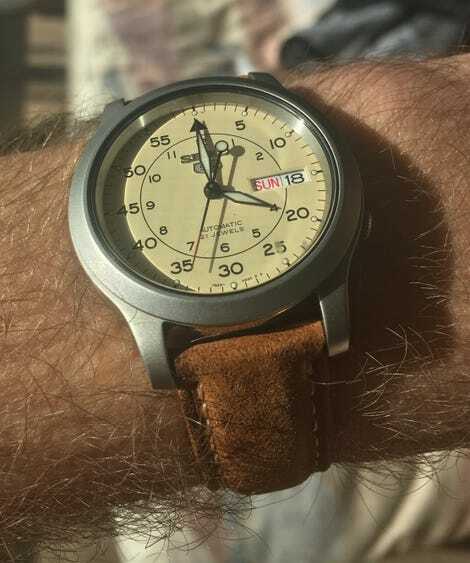 It’s my first automatic and really my first ‘real’ watch, besides a few digitals I’ve had over the years to wear while camping or traveling and one of those classic plastic Swatches I wore when I was a kid. For some reason, watches had never really caught my interest until Matt Farah slowly started talking about them in TST videos/podcasts. Not that I’m such a huge Matt Farah fanboy, but I guess he was just the first to bring them across my radar. I tend to be interested in and nerd out over just about anything mechanica but I’d been essentially ignorant over the difference between quartz and mechanical watches. The turning point really came when he had Cameron Weiss(an independant American watchmaker) on the podcast and I learned a ton about mechanical watches and how they work. Matt now actually also has a watch podcast with Cameron which is pretty interesting(less interesting than cars, but I have a long daily commute so lots of podcast listening time). After a few months of reading up on watches and learning more about heurology, I pulled the trigger on my first mechanical and also my first ‘adult’ watch in general, the aforementioned Seiko. Seiko 5s have a good reputation for quality and the sub-$100 price point was comfortable for me to make sure I actually would like wearing a watch every day etc. I’m a big fan of the field-watch style for daily wear. The only change I made was swapping out the canvas strap that it came with for a $10 leather one. I found the canvas strap to be kind of scratchy, I wasn’t happy with the fit, one hole was a little too loose and the next was a little too tight, and I found the large metal bands to be kind of annoying, especially when typing on my laptop. The leather strap fixes all the complaints I had, and I think improves the look quite a bit. Overall, the Seiko has been great. It’s well made, keeps time well enough and even has a display back, which I think is a great feature for what is undoubtedly a first mechanical for a lot of people. Sure, it isn’t showing off a very special or impressive movement but it’s nice for people who are new to mechanical watches to be able to see what’s going on. The size is also really good for me, as I have wrists on the smaller side of medium and have never been a fan of the ‘big watch’ look. I guess I can add mechanical watches to my ‘list of things that are objectively worse than their modern equivalents but I just like better for semi-rational reasons’ with manual transmissions, carburetors and tube amplifiers. Wearing this intricate little machine with springs and gears and *no battery* on my wrist just appeals to me in so many ways that wearing another little computer doesn’t. I’m already finding myself lusting after something a bit nicer, preferably Swiss, that I can rotate with the Seiko for daily use but also wouldn’t look out of place for more formal occasions. Not that I wear a suit often, but it does happen, and I feel like if I’m going to wear a watch daily I should absolutely be wearing one for formal occasions. Maybe a Tissot or a Hamilton, they have some nice-looking automatics that I’m seeing used for low-hundreds. Of course I’m finding myself lusting after pieces like Omegas and IWCs (Rolex really isn’t me) but definitely cannot justify spending that kind of money at this point, maybe one day for a really special occasion. Although if you really want a trip watch some watch videos, all of a sudden spending $1500 on a used Omega Seamaster is described as “good bang for your buck” and “affordable”.